A part of the [Post]-[Digital]-[Archives] event. First (18.00-19.00): Room NIC0519* on the fifth floor of the Niagara building (Nordenskiöldsgatan 1, 211 19 Malmö, Sweden). (* NB: this is one of the intimate meeting rooms on the fifth floor, not the open studio). Do you have any research data you need to securely dispose of? 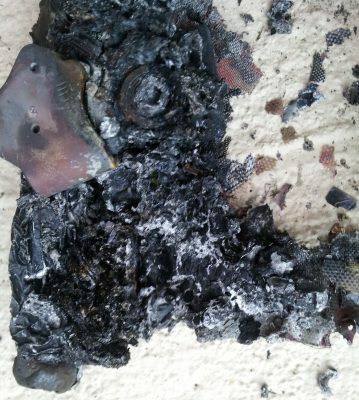 Any old hard drives harboring bodies that you think need to stay buried, but really need to be cremated? Are lingering old devices cluttering your space–mental, physical, or astral? Do you yearn to see data warehouses engulfed in flames? This pyrotechnic extravaganza will explore the potentiality of secure, wholesale, exothermic data liberation. With rogue data collection by all manner of corporate and state adversaries at an all time high, with hardly a day passing by without a new surveillance program or breach of privacy scheme exposed, the question of how to securely delete data has become all the more pertinent. Software solutions are woefully inadequate if peace of mind is to be achieved in the paranoid hyperscape of all-pervasive mass dragnet surveillance we are all treading in. Meanwhile, eco narratives of renewal and reuse gloss over the fact that these are merely ex post facto potentialities following an initial stage of destruction. The event will constitute a tactical, tactile demonstration of the fact that for our digital data to truly become ‘renewable’ it must be liberated from the prison of the physical form, exorcised from the daemon of the hard drive. Following a short cooking lesson on the DIY brewing of an exothermic elixir, join us for a pyrotechnic celebration of unbridled data dissemination, and bring along any devices (any hard drives, USB sticks, phones, tablets, or whole computers) you wish to set free, or any data you wish to liberate (which we will transfer onto perishable devices). Everyone both inside, outside, and in-between the university is quite welcome to attend. This workshop is a part of the [Post]-[Digital]-[Archives] event. Please do spread notice of the event widely and to anyone to whom you feel it may be of interest (students, data enthusiasts, pyro-philiacs and maniacs).